It’s something most marketers don’t really pay attention to. Sure you know the different stages of awareness and how your prospect progresses from attention through to action. And sure, you know that there’s different expectations at each stage requiring a slightly different tact and approach. But how thoroughly do you personalize your messaging for the various stages? Be honest now. Because, in my experience, most marketers don’t do as much as they should. They take a 30,000 ft top down strategy to the different stages of awareness. They generalize or, even worse, they merge. 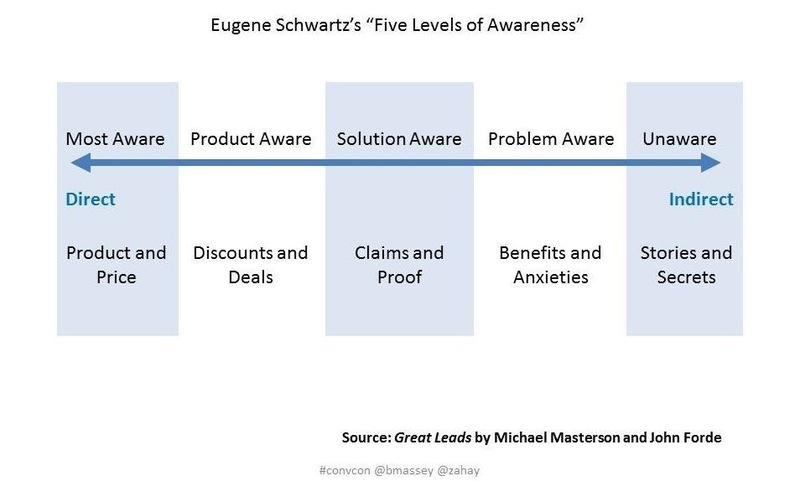 They create one landing page that spans two, three or even four of the stages of awareness outlined by Eugene Schwartz. It’s frustrating because as marketers we all know that taking a general approach with your campaigns achieves little. 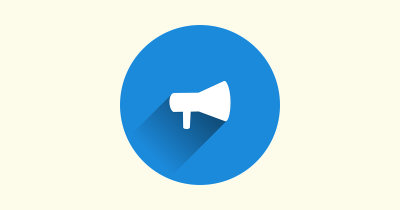 You wouldn’t address your different segments with a generalized sales message would you? So why are you lumping prospects at different stages of awareness together with a singular generic landing page or sales letter? I don’t care if the progression of your singular landing page progresses through each type of awareness. That’s a tactic that only works if you’re selling a cheap product. If you’re running a SaaS business or selling high end, expensive products you’re not going to convince new users to purchase with one page. In fact, 99% of your visitors won’t purchase on their first visit, regardless of how good your landing page is or how it addresses each stage of awareness. You can’t propel a prospect through four stages of awareness in one page. It’s too fast, too aggressive and will only achieve on thing. Turning the prospect away from your brand. You’ve got to think of the stages of awareness as you do your segments. Each is distinct from the others and requires a completely unique approach. You need to implement different landing pages, email sequences and messaging for each stage if you want prospects to successfully move along your funnel. Whilst the idea of segmentation and personalization is often covered and shouldn’t be anything new to you, what’s frequently overlooked is how you should write for the different stages of awareness. How many value propositions does your page have? If it’s any more than one, you’re merging your message. One page, one purpose is the golden rule of landing page optimization. Hell, it’s the golden rule of conversions. Whatever content you’re producing it should only have one goal. The goals for each stage of awareness are different. Your goal with unaware prospects is to make them aware of your brand. With problem aware prospects you want to highlight the benefits of the product and how it solves their problem. These are different messages and need their own pages. Understand the different stages users are at and tailor the content on the pages they see specifically to their needs and expectations. So the question becomes how can you tailor your copy? Your goal for those unaware of your brand is simple. Make them aware. At this stage in the customer journey your prospects are aware of the problem but not the solution. They’ll turn to online sources to research the problem and look for potential solutions. Let’s put ourselves in the shoes of a potential lead. You work for an eCommerce business and aren’t getting the conversion rates you’d like. You need to rectify the issue so you turn to your ever-helpful friend Google for a little help and advice. You type in “how can I increase my conversion rate” and see the below. All of the above results serve as an introduction of the respective brands. They’ve all produced content offering ‘secret’ advice. If the secrets they provide grab your attention they’ve effectively served as an introduction to your brand and established it as a knowledgeable source of information on your problem area. 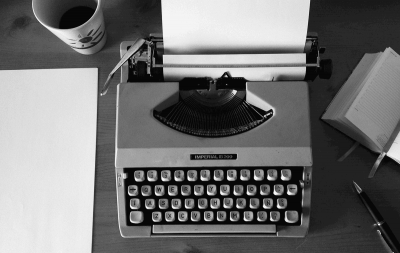 Of course the secrets and stories approach doesn’t just apply to actionable articles. eBooks are a popular option and case studies fulfill both the secret and stories approach to attract the unaware and introduce your brand. Once you’ve produced your introductory secret/story piece, it’s just a case of getting it in front of potentially interested parties. Understanding the problems your users face is more than half the battle with this. Once you know the problems your potential consumers face, you just need to package your content in the right formats. Do you make these X mistakes? The above are some basic formulae. You’ll need to play around with them and see which kind works best with attracting users that progress to the following stages of awareness. If you’re really stuck for ideas though, you generally can’t go wrong with a good old how-to article. This is where things get more interesting. At this stage your prospects know they have a problem, but that’s all they know. They don’t know what the solution to that problem is. This is where you step in. The most successful problem aware pages take a one-two approach. They first highlight the problem users are feeling to grab attention, then present a potential solution. Let’s step back into the shoes of new eCommerce manager. What are your problems? Well, you’ve got low conversions, but you don’t know why. You’ve no idea how to fix them and it’s frustrating the hell out of you. 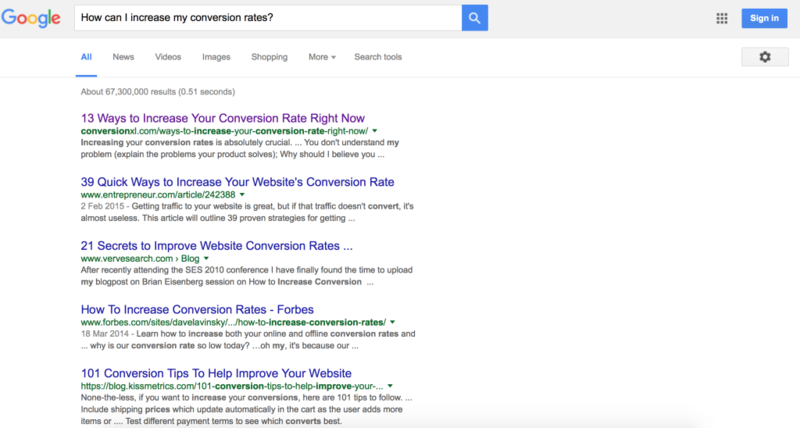 Your Google searches are tailored to understand why your users are leaving your site without converting. In the SERPs you come across a link which leads to the below page. Boom. These guys understand your problems. Your attention is grabbed by the “What’s making your visitors leave?” You don’t know, but you need to find out. The sub heading then offers that exact benefit you’re looking for. It’s the perfect example of a killer one-two that can’t fail to hit the mark. This is a difficult area to sum up with formulae. Each business offers unique benefits and each audience has a different problem. You need to find out exactly what’s causing your prospects to lose sleep and use it to tailor your message. Joanna Wiebe offers some great guides on review mining to find the right message for those with a problem. She used the same method to create the below page which increased CTR by over 400%. Use what you find when researching your audience to find the primary concerns and anxieties to capture attention before offering the solution. Remember, it’s all about the one-two at this point. 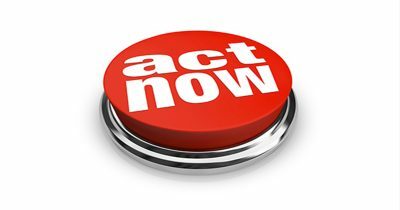 Solution aware does not refer to prospects being aware of your solution. It’s when they know they have a problem and what the solution to that problem is. Think about a soon to be divorced couple. The Problem – They’re in an unhappy marriage. The problem is, there’s lots of divorce lawyers in the world. Why should your prospect choose one service over any other? 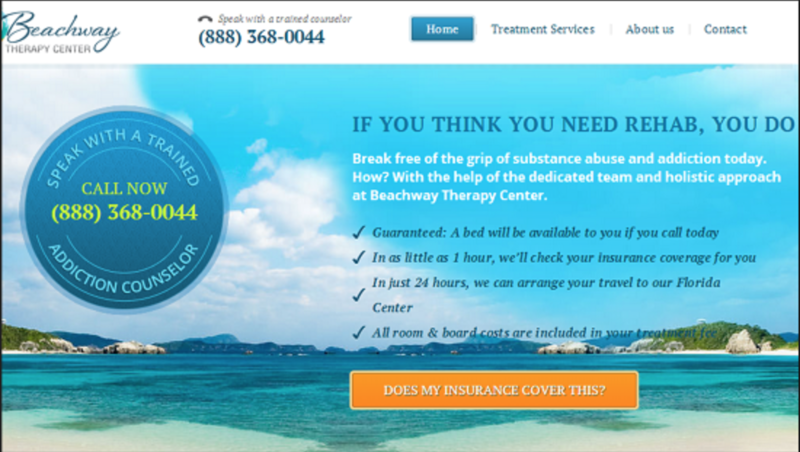 Users at this stage are going to benefit from claims that your product is the best solution for their individual needs. You need to make claims to that effect, but also offer proof to verify those claims. Let’s jump into another example. I’m a runner who wants to increase my speed and reduce my race times. I’ve done my research and know the solution to be a pair of high-end speed focused running shoes. The top Google result takes me to the below page from Asics. Notice how there’s little on the page to prod my fears or anxieties? Whoever’s optimized the page knows that users have moved past fears and are looking for a solution. They take a very structured approach with the page, and jump straight in with the proof of why the principle behind high speed running shoes and why they’ll help you. This is followed by the proof, the construction and technology that allows their shoes to be high performers. Once you’ve got past the proof you’re exposed to a few potential products. I particularly like how they’ve banded the products by goal. Makes it much easier for the user to find the specific solution for their individual goals. Those last few product recommendations also do a fantastic job of ushering to the next stage of awareness. You’re now product aware. Two strategies should always be at the top of mind when making claims. Hyperbole will get you nowhere. Vague claims of benefits are quickly disregarded by prospects. “We’re the best CRO agency in the world” seems too unrealistic. It’s vague and there’s nothing to back up that claim. However saying you’ve won the 2015 best digital marketing agency in your city/country is a believable, honest and most of all provable claim. Whenever you make a claim that your product is the best, always offer proof. I’m not looking for a fast car. I’m not looking for a beautiful car. I’m looking for an Aston Martin. I am product aware. I’ve researched cars and, from the sound of it these Aston Martins seem to be a pretty good product for my needs. But I’m not yet 100% convinced. There’s a big difference between knowing a product, and actually purchasing it. What’s going to make me want to purchase my £140,000 Aston Martin? Generally speaking users at this stage are just looking for that little push. They need that final piece of advice, information or review that’s going to convince them this really is the right product for them. Your goal is to properly educate your visitors on the product. If they’ve found your site through searching for the product’s name, then all you need to do is give them full details on the product to eliminate those final logical sticking points. Here’s how Aston Martin does it. Aston Martin could probably rely on their close ties to James Bond. I mean, paying £140,000 to feel like 007 is definitely worth it, right? Thankfully they don’t. They’ve understood that if you’re looking at a specific model of car what you really need is to be told everything about it. When you know everything there is to know about a product – you can make your decision. There’s no uncertainty and thus no hesitation. The aim is to turn the product aware user into a fully aware user. Answer every single question they might have on the product and highlight the benefits. Aston Martin has done a great job of listing every single specification from engine specs to aesthetic features. They’ve left nothing out and even corroborated much of the information with lovely little videos. After reading through the page the only question I have left is, ‘how does it drive’ which is perfectly answered with their ‘book a test drive’ CTA. That’s what you’ve got to achieve. The only question at the end of pages for product aware users should be ‘how do I purchase/test/take the next step’. Go into incredible detail. Find the most appealing benefits and highlight them in as much detail as you possibly can. This is a critical stage for your users. You don’t want to lose them because you haven’t properly explained a feature or benefit that you think is minor, but is a deal breaker for them. These are the folk who already know everything there is to about your product. They know they want it and they know why. You’ll barely need to convince them to take action. All you need to do here is provide them with the opportunity to purchase. Anything else creates unnecessary friction. They don’t want or need to be convinced to buy so just show them the purchase button and let them do their thing. The only question they’re going to have is do I need it and can I afford it, two questions you have little influence over. You’ll hear all the time how segmentation and personalization are key to higher conversions. You’ll read case studies how messages focused to a particular cohort brought vastly higher conversion rates. But it seems many marketers don’t apply that same detail when targeting the different stages of awareness. They use generic landing pages that do address the different stages, but do so on different areas of the same page. Headline to hook attention, a quick mention of benefits before moving on to the CTA. It’s not a bad method and has proved successful for many out there. But if you can create landing pages aimed distinctly at users at different stages of awareness you should see a much higher conversion rate for that stage of your funnel. The saying “the riches are in the niches” comes to mind here. The more focused you can make your marketing efforts, the more successful you’ll be. Narrow your focus to different segments and different levels of awareness and you could be pulling in conversion rates you’d only ever dreamed of.